This lecture forms the first lesson in the commentary of Sūrat al-Hujurāt (The Chambers), dealing with the etiquettes that should be observed before Rasulullah ﷺ. 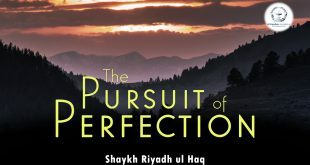 There are events which lead to the revelation of these verses and Shaykh Riyadh ul Haq will expound upon the stories and various narrations which coincide with these verses. The respect and etiquette shown to Rasulullah ﷺ during his life can still be applied today when studying his words. The consequences of a lack of respect are also highlighted in this talk. 4:17 – What is The al-Mufassal section of the Holy Qur’an? 9:09 – What are the themes of this Sūrat? 15:00 – The Year of the Delegations. 21:23 – Understanding the layout of the chambers. 29:27 – How is the poetry of the Arabs comparable to modern day Rap? 36:01 – The incident when appointing a leader over Banu Tamim. 40:35 – Can we resort to our own judgement, opinion & rationalisation with regards to understanding the Qur’an and Sunnah? 48:39 – Is causing offense part of freedom & liberty? 57:27 – How bashful was Rasulullah ﷺ? 1:11:33 – What’s adab before Rasulullah’s ﷺ grave? 1:13:58 – The hadith lessons of Imam Malik رحمة الله عليه. 1:23:57 – Can disrespect of the Messenger ﷺ lead to disbelief?